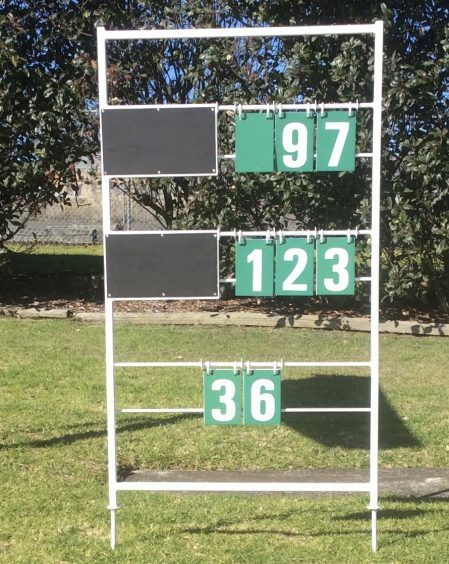 Rink Lawn Bowls Scoreboards are the original Australian Made Scoreboards which have been supplied throughout Australia for over 30 years. They are built to last for many years. One of the biggest problems experienced in Australia in the last 50 years is the emergence of the throw-away economy. With Rink Promotions our products are made the same way they always have been in order to maximise their lifespan and give you the value you deserve. If you want to know more about our products (including Scoreboard Numbers) give Keith a call, he can explain the process and why Rink Lawn Bowls Scoreboards are the best value in the market! We manufacture in Sydney and ship to any location Australia wide. Lightweight, zinc plated and white powder coated that ensures their resistance to rust. ​The numbers are screen printed in a deep bright green on non-breakable PVC with dimples to prevent them from sticking together. These highly visible numbers (100mm x150mm) are durable and will withstand the Australian climate. Wind bar prevents numbers from swinging in the wind and allows quick flip back to blank position. Magnetic blackboards with chalk holder. ​All Rink Lawn Bowls Scoreboards are manufactured and assembled in Australia. Rink Lawn Bowls Scoreboards come with a 4 year warranty. 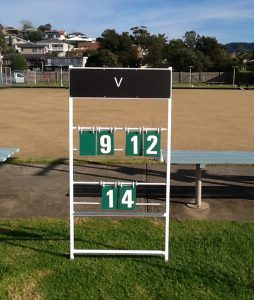 Used to generate extra income the Rink Lawn Bowls Scoreboards Advertisers’ panel is 600mm X 260mm. Proven to be the best value in the market.